Society has always been an obsession with immortality, with living forever and never having to fear death. This fascination with immortality can be found throughout legends and stories, from the Greek gods, to books such as Tuck Everlasting and movies like Peter Pan. Living forever seems like the perfect storybook ending where we can all live “happily ever after”. Recently, immortality has come into the spotlight even outside the world of fiction with research by Dr. Julian Chen on DNA. While the normal cell may shrink and loose some of its DNA as the years go on, this study has potentially found a way to stop DNA shrinkage that leads to cell and organism death. The potential is in telomeres, which are protective capping structures on DNA. These caps act like the plastic at the end of shoelaces: without them, the strand would become frayed and we would not be able to tie our shoes anymore. 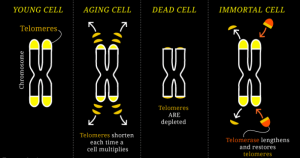 In the cell, the loss of telomeres leads to DNA unraveling and an inability of the cell to divide, both of which lead to cell death, weakness, illness, organ failure and organism death. 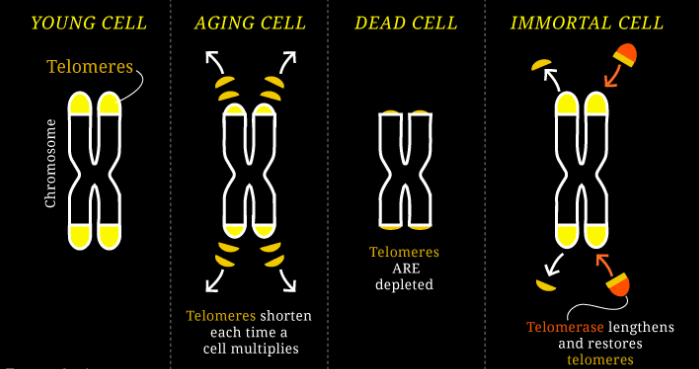 This shrinking of telomeres is due to time, cellular divisions, and the telomere regulatory enzyme called telomerase. These enzymes keep cells from aging too fast by adding telomeres back onto aging DNA and adding lost DNA nucleotides back into place in the DNA strand. Dr. Chen hopes to target the telomerase, accelerating its activity to slow down the degradation of DNA and the resulting cell death. If he were to be successful, he would be creating immortal cells that can continuously divide and support life. This study shows that the immortality may not just be found not in stories or myths or legends, but through science and in our own bodies. Yet as these scientific advancements take place, we must ask ourselves: is science going too far? Do we really want to live forever? My original response to this was an optimistic yes, as I thought of all the good we could do. Without death, lives would not taken and no one would have to be separated from their loved ones. But after reading Dr. Chen’s article the potential to create immortal cells, I began to wonder if having immortal bodies would be worse than dying. What would happen with exponentially rising numbers of immortal bodies? How would the world deal with overpopulation, lack of resources, fighting, wars, and more? There is a lot that could go wrong with this model, and the errors would have a presence in society forever. So while evading death may seem like a fairytale ending, immortality has the potential of leading to many social problems, such as overpopulation and lack of resources, that are currently only solvable by death. Therefore, death may be what is saving us in the end from suffering even though we try to fight it each and every day. Arizona State University. “Hidden secret of immortality enzyme telomerase: Can we stay young forever, or even recapture lost youth?.” ScienceDaily. ScienceDaily, 27 February 2018. <www.sciencedaily.com/releases/2018/02/180227142114.htm>. 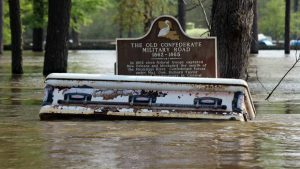 While scouring the internet for additional information for my Op-ed, I came across an article onan un usual consequence of inclement weather: floating caskets. I’ve never heard of anything thing like this before and I had no idea of how this could even be possible. Apparently floating caskets are all too common in New Orleans. The city is located below sea level on a piece of land that was formally a swamp. So in order to adapt to this environment, citizens traditionally “bury” their dead above ground. While initially an ingenious idea, obviously burying dead people out in the open comes with some significant flaws, particularly in the face of major flooding. 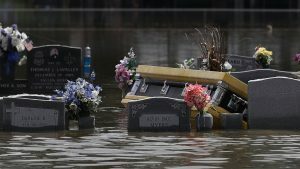 Whenever there is flooding in New Orleans, coffins and old bones can be found floating throughout the city alongside debris from severe weather. Over the years, the city has worked to fortify the ground to prevent this from becoming a recurring issue, but unfortunately, Mother Nature continues to overcome their efforts. As a result of Hurricane Katrina, nearly a thousand dead bodies escaped their burial grounds and drifted around the city. Even in 2016, after two feet of rain fell in less than 72 hours, cemeteries were flooded and caskets were displaced once again. 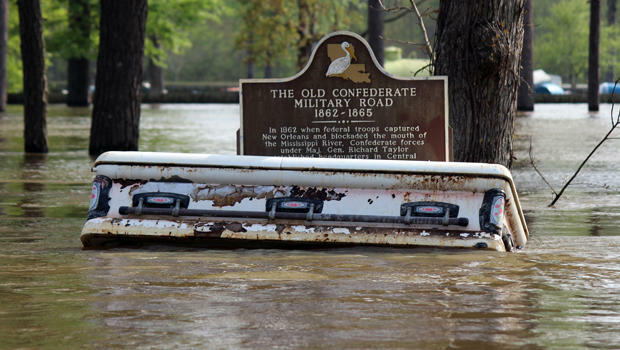 Now Louisiana requires that all coffins have some form of identification. But of course, there are still additional barriers that continue to complicate things. Death certificates placed in coffins are often destroyed and labels wash away. Arbie Goings, of the Disaster Mortuary Operational Response Team, suggested placing bar codes on every casket, but there’s a lot more work that needs to be done in order to accomplish this. Even though displaced caskets are shocking and may be difficult for some to have to experience the burial ritual again, it is common for people of New Orleans to interact with their dead by altering the burial site. Families in New Orleans typically use the same tomb or plot for each dead person. So when someone dies, the oldest coffin in a tomb or grave is removed and destroyed. Their remains are put into a body bag and placed in the corner of the tomb or grave to make way for the new addition. Some families have even used the same tombs for more than 150 years. Some organizations establish large “society” tombs for their members to be buried. The Swiss society has its own tomb and the Italian and Portuguese society has their own as well. New Orleans has very unique cemetery practices that have proven unsuitable for severe weather. It’s humorous as an outsiderbecause I’ve never imagined anything like this before but understandably disheartening for the loved ones who have to deal with this issue. I am not sure if there will ever be a permanent solution to keeping the caskets in their place. However, if this issue eventually becomes unbearable, residents of New Orleans could consider using other funerary options such as cremation or mausoleums. Are Selfies Worth the Risk? What would you do for the perfect selfie? The emergence of the front-facing camera has revolutionized the way we make memories and document our lives. We can’t go anywhere without documenting our latest vacation or trip to the most artsy place in town. If we don’t take a selfie, where we even there at all? It turns out there have been a number of accidental deaths linked to this seemingly innocent activity. In 2016 alone there were more selfie related deaths than shark attacks. In 2015 a man reportedly died from a lightning strike that hit his selfie stick, electrocuting him and killing him. A 66 year old tourist fell backwards down the steps of the Taj Mahal in 2015. He sustained head trauma that led to his death. Witnesses stated that they saw him trying to execute a selfie before the man lost his balance. In the past few years there was a series of incidents in which young people trying to show off guns on live video accidentally shot themselves and died. In our society there is the pressure to get the perfect selfie. This causes people to become less aware in their surroundings, opening the door for accidents to happen. Apps like Snapchat have instituted warnings to not take selfies while moving/driving in order to limit the amount of car crashes due to distracted driving. It seems that anything, even the most innocent of actions, when taken to the extreme or done in an unsafe environment can cause harm. The deaths of each of these individuals is tragic. The adage, with more power comes more responsibility, should hold true in our use of technology. As we are able to do more and more things due to technology, we must remember that are actions have consequences. It is wonderful that we can text and call people while we are on the go, but killing ourselves our someone else in a car accident because we were busy texting is not the way to embrace the strides we have made. The #SelfieOlympics, a viral selfie phenomena a few years ago, shows how the art of the selfie has evolved. The goal was to take the craziest most elaborate photos, all while in the comfort of one’s bathroom. The use of props was encouraged, and the more one could defy gravity the better. Eventhough social media crazes such as the #SelfieOlympics are super fun and relatively harmless, we should be mindful that actually living our lives is more important than capturing every second of them. The reality is that while trying to capture every moment of our lives, we are actually letting a lot of it slip past. We must ask ourselves is having the wildest selfie worth it? Maybe not if it means we are risking our lives or the lives of others. Here’s a video of selfie fails that resulted in accidents, but nobody died. Enjoy. This is Kelsey Mason. Back in 2004, Kelsey was reading in her room by an open window. Her brother ran in wearing a mask to scare her. She startled back and fell out of the window. Her brother screamed, and her family rushed outside and saw her lying on the ground with her neck cracked. She was dead. A year later, Brandon Madison was reading a message about Kelsey. He did not forward it to his friends. That night, as he was sleeping, he was snatched out of bed and thrown out of his window. His family discovered him the next morning on the ground with his neck cracked. If you don’t forward this message to 10 of your closest friends in the next 5 minutes, Kelsey Mason will come into your room tonight and kill you. Uh-oh. The threat is definitely fake… but are you willing to take that risk? To put your life on the line? It doesn’t take you long to make your decision. After all, you only have five minutes. Like this post or your dad will die in a car accident this week. Repost this image or (insert random name) will kill you tonight. 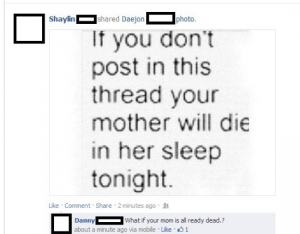 Every time I see a post like this, no matter how absurd it is, I get just a little bit paranoid. Do I want to die over a like? 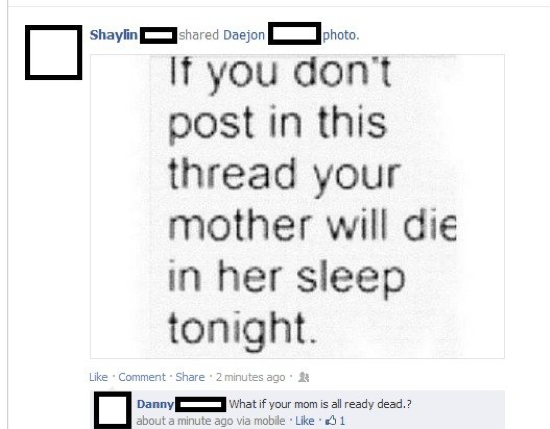 Or for my mom to die? She is not even involved in this situation. Who makes these posts? No matter the year or the technological developments, it seems that people will always have an obsession with targeting the universal fear of death for likes or for reposts or, more simply, for fun. Maybe they love chaos. Whatever their motivations, these posts do receive likes and reposts. Death is perceived as so random and uncontrollable that people are often unwilling to risk it, especially for something so stupid. What are your thoughts on these kinds of posts? Have you ever like or reposted anything along these lines? Or forwarded a chain email or text in your youth? The great unknown associated with dying has resulted in a societal fascination – no, obsession – with death. Death is everywhere from our newsfeeds, to our music, to our literature and movies. Yet as frequently as death comes up in our lives, so does its opposing force: immortality. From legends of the fountain of youth throughout history, to religions which qualify the afterlife as a form of “eternal life”, to fantasy shows like Game of Thrones, in which characters die and resurrect left and right, we are just as enamored by the concept of evading death as we are exploring it. Science fiction has toyed with the idea of immortality through technology since the beginning of the genre. However, in a time when we are maybe 20 years from roads exclusively populated by self-driving cars, some people have claimed that immortality through science may no longer be fiction. One such individual is leading ‘futurologist’ Dr. Ian Pearson, who predicts that humans could outlive the restraints of physical bodies by the year 2050. This estimation refers to proposed virtual reality worlds where people could upload their consciousness before their bodies fail. Personally, I’m more fascinated with the idea that genetic engineering could slow or even reverse cellular ageing, making biological immortality a plausible concept. For my non-sciencey counterparts out there, gene editing is the phenomenon in which scientists locate a problematic gene in an organism, use enzymes to snip it out, and replace it with the functional or desired copy of the gene. The most popular and groundbreaking system for gene editing at this time is CRISPR-Cas, which I’m sure lots of you have heard of. At this point, genetic engineering research revolves around diseases and disorders which could be greatly reduced or even eradicated with this technology. However, when most people hear ‘genetic engineering’, they think about ‘designer babies’ and dystopias like that portrayed in the 1997 film GATTACA (10/10 would recommend). Because of our society’s focus on the fantastic applications of this technology, it’s not surprising that there is talk of regenerative medicine as a means of achieving immortality. The ethics of gene editing is a hotly debated topic, both for the discomfort it stirs up in the general public, as well as more imminent scientific concerns. A group of prominent scientists urged for a ban on all human genetic engineering in the U.S. in 2015. This general ban did not pass, but genetic engineering of humans is tightly regulated in the US. It is for this reason that I disagree with claims that immortality through genetic engineering could be achieved in our lifetime. Many people are rightfully hesitant to consider messing with nature by ridding the world of mitochondrial disease, for example, which we already have all the essential parts to do. While I think our society is capable of the technology required for this kind of science, I don’t think humans will be able to accept a life without death anytime soon. Intrigued, I clicked on it. Although poorly acted, the case presented was very interesting. It was about a young woman who believed she was dead and consequently refused to eat. She had Cotard’s Syndrome: a mental illness in which a person believes that they are dead, decaying, non-existent, or have lost internal organs or blood. It was first described in 1880 by neurologist Jules Cotard who was presented with a patient known as Mademoiselle X who did not believe certain parts of her body existed. She believed she did not need to eat and explained that she was condemned to eternal damnation. She died of starvation, which unfortunately is a common consequence of the illness due to patients believing they do not need to eat. Cotard’s is described in the Diagnostic and Statistical Manual of Mental Disorders (5th Edition) as a type of somatic delusion that involves bodily functions or sensations. Although not outlined in detail in the DSM, an individual is more likely to be afflicted with the disorder if they have schizophrenia or experience psychosis, neurological illness, another mental illness such as depression, brain tumors, or migraine headache. The syndrome normally exists in three distinct stages. The first is the germination stage, in which depressive and hypochondria symptoms appear. The second stage is called the blooming stage, in which delusions of negation start appearing. The last stage is the chronic stage, in which the patient suffers prolonged severe delusions and chronic psychiatric depression. All three stages severely impact the patient’s ability to care for themselves, leading them to neglect their physical health and personal hygiene. The syndrome can have severe impacts on a person’s interactions with the world; their negation of self often comes with a distorted view of the external world. For example, a patient described in the article “Betwixt Life and Death: Case Studies of the Cotard Delusion” was hospitalized in 1990 because he believed that he was dead. His mother took him to another country after he had been discharged. He believed that he was being taken to hell. He had lost touch of where he was in the world and he interpreted external sensory output differently. The weather which was hotter in the country they were visiting was seen as a reason to confirm that he was in hell. Because of the extremity and rarity of Cotard’s Syndrome, it is often hard to diagnosis and therefore treat, so the patient often suffers with the symptoms for an extended period of time. This was the quote etched into the condolences card my family received after our dog passed away last November. We lost more than a pet — we lost a member of our family. I had arrived home on Tuesday morning for Thanksgiving break, one of my favorite times of the year because it was a rare occasion of gathering with relatives and friends to eat turkey, stuffing, and cornbread but also traditional Chinese and Taiwanese dishes. 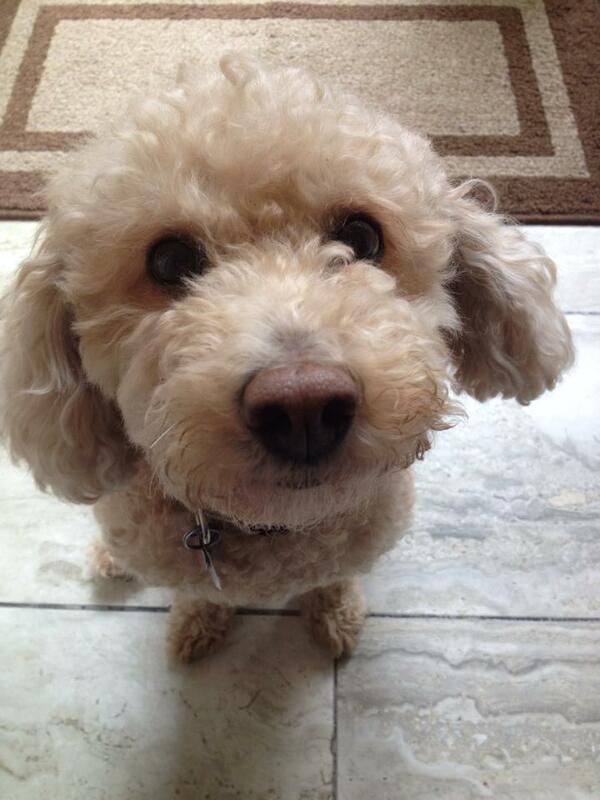 However, that same evening, my dog suddenly collapsed and passed away. In the moment of her death, my mother and father were devastated. They cried, wailed and clung onto her body, trying to shake her awake. Beside them, my younger brother sat stiffly with an emotionless face. I immediately stood up and searched the house for gloves, sheets, trash bags and cleaning supplies. My parents tearfully urged my brother and I to say our goodbyes, and my mom insisted on cutting a lock of her hair and keeping it. In the following days, we cancelled all Thanksgiving plans, and we managed logistics for cremation plans in order to take care of the body. My mother refused to throw out her bed, toys, and items, and she would speak to a photo of my dog as if she were still there. My father, a few days after her death, set out some apple slices (her favorite) and some water, saying that spirits of family always return to visit a few days after their passing. When I initially researched dog burials, I was surprised by 1. The fact that they existed, and 2. The amount of pet cemeteries there were in close proximity. My family ended up asking our veterinarian to help take care of the body, we as needed a place to keep her over Thanksgiving. He asked us if we wanted an autopsy, but my parents said no, as they did not want to harm her physical body and hurt or disturb her spirit. The vet set us up with a nice pet funeral home that helped cremate our dog. My mother chose an urn, which included an impression of her paw print out of a few different options. We loved our dog like another family member, so we went through a grieving process as if we lost a human family member. Through this experience, I realized that there are many parallels in psychological and emotional impact, feeling of loss, and rituals for humans and pets. With growing concern for the environment and humans’ impact on the environment, some have recently become dissatisfied with current options for the internment of themselves and their loved ones. Cremation, on average, utilizes the same amount of electricity as one person would use in an entire month. It also releases greenhouse gases into the environment, something many have been attempting to lower for decades. Traditional burial isn’t as eco-friendly as some would like either. Most coffins are made from wood, which is a concern because of growing deforestation. Additionally, heavy machinery is usually required, again emitting gases into the atmosphere. There is also growing worry that embalming fluids, over time, could leak into the ground and contaminate water sources. For those who are deeply concerned about improving the environment, this has left them in a conundrum of what to do when they pass away. Some have considered the option of a biodegradable coffin, which eliminates the concern for trees, but again, burials typically require heavy machinery, which some eco-conscious individuals wish to avoid. This is the situation Katrina Spade found herself in. She had no religious or cultural ties that she felt she would need to honor after death. While searching for a solution to her dilemma, she happened across a technique used by farmers for large animals who died. Some farmers compost large animals and use the compost on the farm. This sparked an idea for Spade and she decided to develop the Urban Death Project, now known as Recompose. Recompose is dedicated to finding a way to compost the deceased to truly give back to the environment. Spade describes the process as combining corpses with wood chips and aerating them in a reusable module, as the recomposing process occurs, the bodies sink down into a composting bay. As one body sinks down, others are added on top, though Spade only plans to have two services a day to limit time constraints on families. After around 30 days, the material is sifted and the compost is removed to be used in public parks, though friends and family are encouraged to take some compost for their own gardens. While this eco-friendly option isn’t currently available, Spade hopes to soon make it a reality. Currently headquartered in Seattle, Recompose has registered as a Public Benefit Corporation and has stated that they are attempting to emulate nature, because nature is really good a death. Recompose has also stated that they are dedicated to making this as accessible to everyone as they can, and that they aren’t concerned with profit. This option may not be for everyone, and that is understandable, however, for those concerned with their lasting carbon footprint, Recompose may be the answer to their queries. We often talk about what it means to “truly live” or even more simply what it means to be considered “living.” This idea was one of the main points of the Terri Schiavo case and this idea came back to me in the form of a conversation. A few weeks back, I was talking to one of my best friends about a book she had recently read called When Breath Becomes Air. The book is an autobiography written by Paul Kalanithi. Kalanithi was an outstanding medical student at Stanford who was in the residency stage in his path to becoming a neurosurgeon and all was well in his life. Then one day, his life came crashing down as he was diagnosed with terminal Stage 4 lung cancer. My friend explained to me that Kalanithi wrote the book to not only tell his story but more importantly to discuss how to think of and approach life when diagnosed as terminally ill. Kalanithi talked about how he truly “lived”when he realized he was dying. Although I haven’t read the book (yet), I did a good amount of research and surfing behind Paul’s story to get a better idea of his vision of life. As the news of the death of Stephen Hawking shook the world, I came across an article on the web, and a particular line caught my attention. “Those who live in the shadow of death often live the most” was the opening line of one of the paragraphs. Although the article was about Stephen Hawking and his life, I immediately thought back to the conversation with my friend about Paul Kalanithi. This is the idea that he so very well embodied in his memoir, and I would like to share a few thoughts on how he did so. It is obviously a far stretch to claim Paul took his situation “in stride”, but the way he talked about how to approach death with grace makes the reader reconsider what it means to be fully alive. Paul often talked about his experiences in residency, and repeatedly brought up that he didn’t want to be a doctor to “help save lives” as the cliché goes. For Paul, the biggest goal was to help people understand death and illness. Helping save someone’s life wasn’t worth it to Paul if it meant that patient was now bound to a life that he would not find worth living (being severely handicapped, for example). This was a bigger failure to Paul than the patient dying. We often set an ultimatum for those that are ill. We think they must be saved at all costs because in our minds; death is the worst possible scenario. Kalanithi claims life isn’t about avoiding suffering, because everyone will die. There is not point in worrying about death, because as long as you aren’t dead, you are still living. I will definitely have a much better idea about Paul’s message when I get around to reading the book soon, but the article that I came across reminded me of the conversation with my friend and even further, the Terri Schiavo case. There is of course no one right way to approach death. But Kalanithi’s message is certainly one that can potentially alleviate stress and make this adventure that we call life a little more pleasant. -icle was to inform the public of the prosecutors’ overall goal in regard to Cruz vs. The State of Florida. This is a very controversial topic because we, as a society, are not in a position to play God, yet we still take the decision upon ourselves to do so. Besides the obvious and logical fact that our nation is in dire need of stricter gun control, the discussion of how to deal with those who commit such atrocities rarely surfaces. Our justice system will sentence the death penalty, when deemed justifiable, but is capital punishment ever justifiable? In the article, the prosecutor stated that this, “certainly is the type of case the death penalty was designed for.” In all honestly, I have no idea what that means. When were we granted the right to play God? There is nothing to gain from the execution of a wretched individual. The only major benefit is the quality of life for the prisoner being executed, since they will not have to spend the rest of their life rotting in prison. In the simplest of terms, death is the easy way out. When considering the options that are on the table for Nikolas Cruz, they are either life in prison without parole or the death penalty. Nikolas Cruz stole the lives of seventeen innocent people and, consequently, affected hundreds of others, so why put him to death? Time is a gift, but it can also be a punishment. Locking an individual in a small space, thereby stripping them of their freedom, h as been shown to have detrimental and degradative psychological effects, not to mention, imprisonment will save taxpayer money. Our nation is obsessed with taxes. When major elections approach, one of the first topics to emanate is taxes. 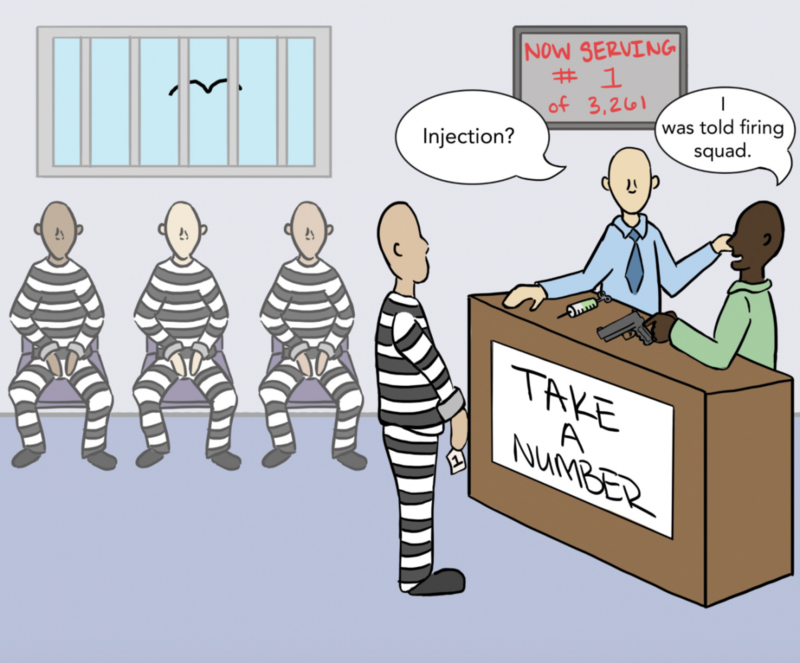 In the majority of states, capital punishment, meaning lethal injection, costs more than it does to imprison someone. According to The Death Penalty Information Center, Florida would save about 51 million dollars a year if they instead sentenced prisoners on death row to life without the possibility of parole. 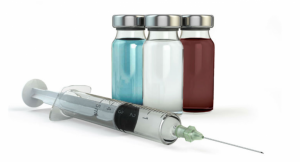 There are currently 347 people on death rowin Florida and it costs an estimated 3.2 million dollars for each individual executed. There are a multitude of other things that money could be allocated to, such as better funding to schools, lowering rates of homelessness, or literally anything besides than killing more people.